(Newser) – Dow Chemical is pushing the Trump administration to scrap the findings of federal scientists who point to a family of widely used pesticides as harmful to about 1,800 critically threatened or endangered species. 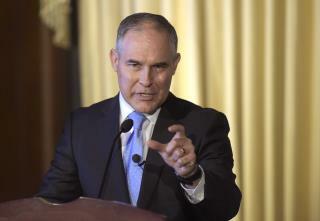 Lawyers representing Dow and two other makers of organophosphates sent letters last week to the heads of three Cabinet agencies. The companies asked them "to set aside" the results of government studies that the companies contend are fundamentally flawed. The letters, dated April 13, were obtained by the AP. Dow hired its own scientists to produce a rebuttal to the government studies showing the risks posed to endangered species. Nice try, Dow. No deal. No favoritism! What a completely obvious and disgusting example that the president's EPA is for sale, and soaked in cronyism and graft. Disgusting. And nothing to do with American businesses being competitive on a regulatory level, whatsoever. I guess we'll see what the purchasing power of $1,000,000 is. I don't suppose it's too late for Trump to head back to the trough... is it?